I sometimes wonder if my garden grows because of me or in spite of me! The following pictures show two examples. 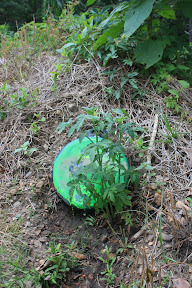 Volunteer tomato plant that is growing in a dirt mound, in front of a a spray painted old skillet that we use/used for target practice. MY DH pointed it out to me today. Obviously it has been growing for awhile. A bucket fell on this pepper plant a few weeks ago and it broke completely off at ground level. I figured I had nothing to lose and I stuck it back in the ground immediately. All the leaves fell off, but it is now sprouting new leaves. 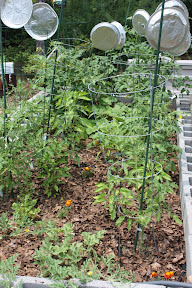 Garden at 6 weeks. Although it is not made out of pretty wood or landscape blocks, the concrete blocks are practical. The garden is in the back of the yard and hidden by pine trees and azaleas so it is not seen by the road. 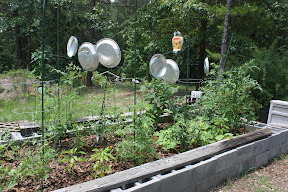 Pie pans and owl are bird and squirrel deterrents. It is not much compared to some of the wonderful gardens I have seen posted on here, but I like it and last year I got enough for my family and enough to share a little. Nicely done. I've seen photos with that type of cinder block, planted with herbs and flowers. Makes use of every inch. Thanks! I plan on filling the blocks with soil, compost, etc. and use it to plant even more things. Unfortunately, I did not get things done over the winter that I had planned. You have the perfect garden. I envy you and agree with your philosophy. Sometimes we have a tendency to over complicate things. Plants simply want to grow and everything doesn't need to be perfect. That's a good looking volunteer. You gotta love those. Funny where they show up isn't it? I have them everywhere, tomatoes that is. Well I pulled hundreds of them, though I left a few in prime locations those and the curcubits. The pepper plant is like my last black cherry plant. I was going to plant it and was taking off the lower branches when I snapped the main stem in 2 about 3-4 inches above the soil. I left it in its' container and is it is now shooting out a stem. I'm am going to see how far this one will go. Last edited by gixxerific on Mon May 31, 2010 12:43 pm, edited 1 time in total. It's remarkable, isn't it, how plants recover from a broken stem? I did an experiment with some leggy seedling that barely had their true leaves showing. I cut the stem about half way up and replanted the bare stem. They all lived and, although a bit behind the others in growth at first, now are in the ground and look as good as any of them. 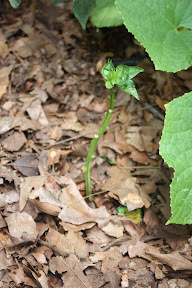 garden5 wrote: It's remarkable, isn't it, how plants recover from a broken stem? I did an experiment with some leggy seedling that barely had their true leaves showing. I cut the stem about half way up and replanted the bare stem. They all lived and, although a bit behind the others in growth at first, now are in the ground and look as good as any of them. I wrote elsewhere about this but I took the top part of the plant and shoved it in the ground. It went limp and that looked even worse. I about stepped on it today than started thinking "what is that I didn't plant any thing here". The tomato came back and actually looks kinda decent. Imagine that. I'm calling it my "energizer plant" cause it keeps going and going. It was flat and totally wilted now it has life to it.